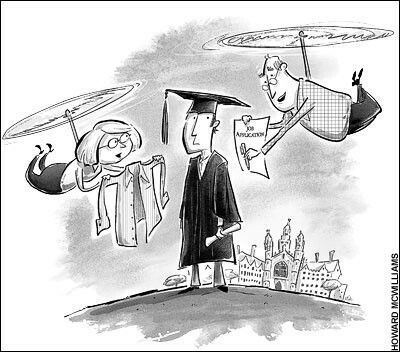 Recently, U.S. NEWS & WORLD REPORT published a candid article broaching the curious subject of "helicopter parenting" and the lasting affect it can have on students. In addition to contributing his expert pedagogical opinion to the U.S. NEWS article, BASIS Independent vice chairman Mark Reford shared his thoughts further with us. Without a doubt, helicopter parenting is alive and well on the consciousness of our culture. I always prefer to speak about “helicopter parenting”, not “helicopter parents”, because in truth this is a temptation that I think most parents have surrendered to at some point in our lives. I know I have. It can be too easy to see the label, “helicopter parent” and dismiss it as the bad stuff someone else gets up to. The most important place to begin any discussion of helicopter parenting is to recognize that we are acting from our own insecurity and drive for perfection. Helicopter parenting is driven by fear. Parents fear that the teacher is not supportive of their child, or that the school will fail them, and only the parent stands between their child and negative consequences. Yet beneath these fears about the external environment, some of which might be fully justified, is a more damaging fear: the anxiety that one’s child isn’t strong enough, ambitious enough, independent enough, smart enough, to learn to handle their own problems and to make it on their own. But what all of us really want for our children is that they will grow up to be autonomous, to become their own man or woman. Helicopter parenting makes students feel they cannot do this. It cripples their healthy development as independent actors and leaves them less equipped to handle setbacks and challenges, less equipped to handle the slings and arrows of normal life. Children want to feel powerful. If we as parents always jump in to rescue our child, we will raise children who think they require rescue. The notion that unless the child is pain and frustration free they will not succeed is injurious and faulty. Indeed, the truth is just the opposite: frustration and pain inform. It is important to allow the child to learn to manage these emotions and to put the objects that inspire these emotions into perspective. The universe we live in is not problem-free; our children must learn to problem solve effectively. It is our job as parents to teach them how to do this. Sadly, protection is not a problem-solving strategy. What are your thoughts on helicopter parenting? Share your comments with us below. Head on over to U.S. NEWS to read the article in its entirety. While you're there, check out the latest results from their annual ranking of the nation's best high schools - a hearty congratulations to BASIS Scottsdale for taking the #2 spot overall, #1 Charter School and #3 STEM school!